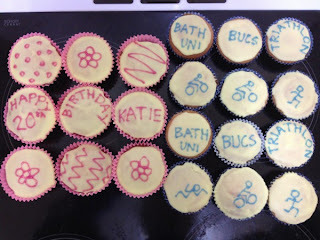 Sunday 6th May, off to Calne in Wiltshire (all be it just down the road for the team of 20 Bath Triathletes!) for the annual BUCS Sprint race. Huge entry list this year of over 400 athletes from Universities up and down the country. Great atmosphere and the sunshine peaked out from the 2 weeks of rain especially for us. St Mary's school hosts the event, the 25m indoor pool for a 30 length swim to make 750m, a one lap bike course of undulating 25km and a out and back 5km to finish. All in all a great little venue with everything on hand. My own performance wasn't quite as good as had hoped (or planned!) but a cold hit me a few days before the event which as much as I tryed to ignore, annoying affected my performance like it would any other athlete. Though had a great swim swimming a new personal best for 750m, 10minutes30seconds, and finished 4th female in the run which I was delighted with. The bike course was hard, much power and strength required, and just wasn't really my day to shine. I came in to the finish line after a tough but what felt like a smashing run, to the whole team who had finished their heats earlier in the day, and some lovely birthday (29th April for those who forgot ;) ) cupcakes, make by the team. More importantly the Bath Team put in a fantastic effort, with our top spot of the day going to Doug Hall who finished 3rd in the mens race. Everyone else thoroughly enjoyed the day, with PBs being smashed, fast bike splits and every last ounce of energy used on the run. Great work team! Maybe the highlight of the day (look away coach) was the evening social meal, in the infamous 'Jimmy Spices', an all you can eat restaurant, notorious amongst hungry students, triathletes in particular. It was also a week after my birthday and I had a few surprises yet to come! After over 6 courses (the plates are small), I was sung 'Happy Birthday' and presented with a rather large, chocolate fudge cake.